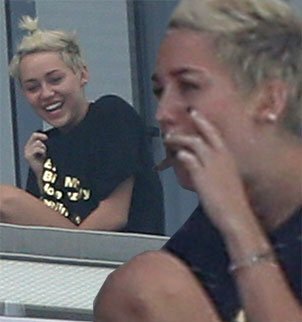 Back in February, a photograph of what appeared to be Miley Cyrus smoking a suspicious hand-rolled cigarette was uploaded on Instagram, and on Saturday, the star sparked concerns once again when she was pictured enjoying what appeared to be the same on her hotel balcony. Miley Cyrus, 20, was seen inhaling and puffing smoke into the air as she sat outside at her accommodation in Miami, Florida, with the brown paper coated item. The singer chatted to friends as they relaxed on a veranda, looking as though she had just woken up as she donned only a black T-shirt with gold writing across. Miley Cyrus squinted her eyes as she took a deep drag of the cigarette with her left hand, which was missing the engagement ring given to her by fiancé Liam Hemsworth. Afterwards the star laughed to herself as she peered down at the action below her. Later on Miley Cyrus covered up her messy locks with a black beanie hat and covered her eyes with huge dark sunglasses. Again a suspicious object was seen between her forefinger and thumb as she inhaled and exhaled the smoke. Miley Cyrus and Snoop Lion released their new collaborative track Ashtrays And Heartbreaks on Wednesday. While the track’s title may sound like Miley Cyrus is about to reveal the truth behind her rumored relationship split, she instead reflects on friends who have passed in a reggae – and drug reference infused – melody. The collaboration, which will feature on Snoop Lion’s new album Reincarnated, is the first of many expected from Miley Cyrus as she prepares to release her new album.